Long-Legged Friends is, literally, the result of a grandmother's love. Hisako created cuddly creatures to amuse her grandchildren and quickly built a following in her home country of Japan. For the first time, her charming patterns have been brought to life in English, and her adorable toys will soon be amusing American children... as well as quuite a few adults, I'm sure! A take-off on the Japanese art of knitting anthropomorphic characters, Long-Legged Friends features 7 different fuzzy animals, plus mini versions of each and some snazzy traveling clothes. You'll find yourself needing to cast on one of each: Fuzzy Rabbit, Curly-Tailed Cat, Furry Bear, Striped Bird, Spotted Bull, Fluffy Poodle, and Zigzag Pig. Your only dilemma will be which one to cast on first! In addition to easy-to-follow patterns for these cute, contemporary, elegant, understated, black-and-white stuffed animals, you'll also find whimsical illustrations and photos of the dolls in playful poses. 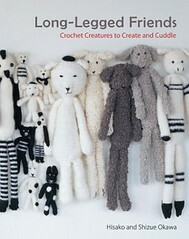 Long-Legged Friends is here just in time for holiday gift making! Money simply can't buy the one-of-a-kind stuffed animals you can create. Pick up a copy for your crafty bookshelf today and get ready for the hugs and kisses you'll receive when you surprise the little ones on your list this year! These are gifts that are sure to become favorite buddies for years to come. About the Authors: Hisako is a lightening-fast crocheter and grandmother who began creating toys to amuse her grandchildren. After building a following in Japan, Long-Legged Friends was born. Shizue, Hisako's daughter, illustrated the detailed photos in the book. Disclaimer: Andrews McMeel Publishing sent Lapdog Creations a complimentary copy of Long-Legged Friends for review purposes. I was not compensated for this review. All opinions expressed in the review are my own. Great idea. Looks likes lots of fun creations. Have a terrific Thursday. And so, are you making some for the Lapdogs, or will they simply shred them? Maybe those nieces need some? Those look cute. I don't crochet either and used to call my Mom and ask her to do the crocheted items for me. Now, I just don't have the interest in learning, too many other things to do.